Let Hornblower New York help your family celebrate Thanksgiving this year. 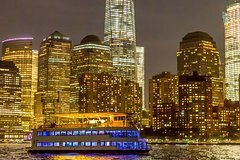 On your Thanksgiving Dinner Cruise you will enjoy a delightful and plentiful buffet, gracious service and stunning views from Hornblower Sensation's Main Deck. Add a boarding glass of Sparkling wine or Apple juice and it will be a dinner to give thanks for! Boarding docks are located at Pier 40 in the West Village. Once you check-in on the pier you’ll be boarded on to our luxurious Hornblower Sensation yacht. Seating will be shared style seating with other guests and families. This is the only way to do Thanksgiving with a bountiful buffet with all of the Thanksgiving favorites, just like you’d expect. You’ll also see all the other great and historical sights, Governors Island, the Brooklyn Bridge, Manhattan Bridge, that amazing New York skyline and, of course, the Statue of Liberty. It only happens once a year and you’ll feel the excitement onboard as the holiday season kicks off. Nowhere else on Thanksgiving can match it. The cruise ends back at Pier 40 at 8pm.